In 1492, Columbus sailed the ocean blue! 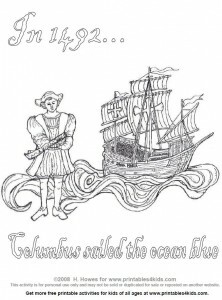 In honor of Christopher Columbus and his voyage to America, we have created a great new Columbus Day Coloring page. Click on the image above to view and print full size or download Columbus Day Coloring Sheet as a PDF file. If you enjoyed this printable activity, please like us on Facebook, sign up to have new activities delivered directly to your inbox or subscribe to our monthly newsletter.